The very latest news on prices and special offers relating to new and used Vespa scooters and mopeds brought to you by Scootercrazy! Vespa main dealer in Barnsley, South Yorkshire. Below you will find all the information on 2019 Vespa models including colours, prices, stats and technical information. There are also some great advertising images and info of Vespa old and new. 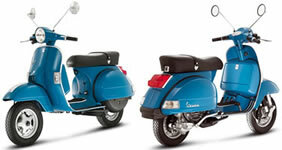 A fantastic new member of the Vespa small body range is the all singing all dancing Vespa Primavera. This scooter has taken some of the refinement and styling of the Vespa 946 whilst maintaining the shape of it's predecessor, the Vespa LX, thus bringing an old favourite up to date and in keeping with the changing times. The Vespa Primavera is also an ideal choice for those who are new to the scooter scene as it is lightweight with a smaller frame than some of the others in the range This makes handling easier whilst you get used to nipping through the streets and avoiding all the heavy traffic. You may then want to consider upgrading to the Primavera's bigger brother, the GTS! New saddle with improved ergonomics and larger seating area for passenger. New finishing and trims with new rims design. 11 inch front and rear wheels with new front ESS suspension. LED day light and rear lamp and new instrument panel. 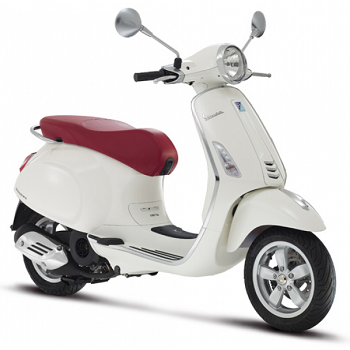 The New Vespa Primavera comes in a large selection of colours including black, white, red, blu energia and verde relax. A new Enhanced Sliding Suspension ESS, which will increase the level of safety and comfort for both rider and passenger. The new suspension has been totally re-designed by Piaggio R&D in order to reduce frictions during riding, increasing driving comfort and handling. The shock absorber used to be fixed by two screws, this is now fixed by a hinging pin. The instrument panel of Vespa Primavera is characterized by the LCD display placed in the bottom part. The display shows all the important information such as odometer, trip, fuel level and clock. The trip mode button is placed on the right handlebar control. 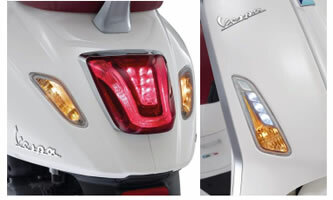 The technological level of the Vespa Primavera increases also in the lighting system, thanks to the LED technology. Front DRL and rear stop light are LED lights, which make a modern and elegant solution compared to traditional lights. The most evident innovation is represented by the front DRL (daytime running lamp) LED lights (only on the 125 version). The new frame design increases the level of comfort thanks to the new battery position in the central body rail. This gives a lower center of gravity to the vehicle which means improved stability. An additional benefit is the increased under seat compartment which is now 16.6 litres of capacity, enough space for a full helmet and other objects, and covered by a scooter mat. The saddle can be now easily opened pushing the button (only on 125 model) placed over the glove box. The Vespa Primavera scooter is set to be another widely sought after model and a key member of the Vespa family for the 50cc and 125cc Vespa riders. For more information or details on finance available please call us on 01226 203377. Manufactured in the same Italian factory as it's predecessor but with more style, speed and that little extra something this time round. The PX was the scooter for every need, whether it be commuting to work, nipping through busy streets, or just to be brought out on those glorious summer days to enjoy a leisurely ride and then relax in your favourite beer garden (after arriving in style!). Vespa owners are more than just owners of a scooter, they are part of a community of riders who have a passion for quality and style. 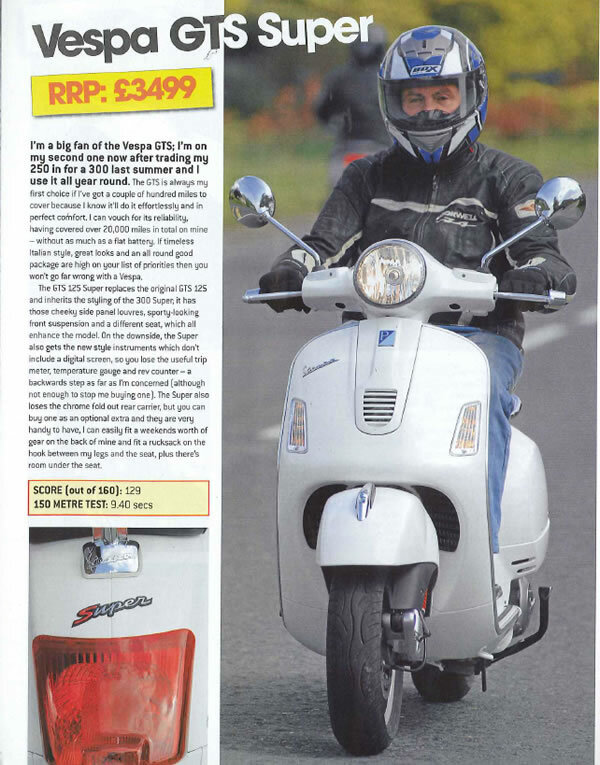 Why not become part of that community and invest in the ever-classic Vespa PX200! As you can see, there were instantly recognisable features of the Vespa PX Scooter such as the retro tailight, practical spare wheel, sleek chrome trim and shaped front shield have all been kept whilst small changes to the seat shape have been made with rider comfort in mind. 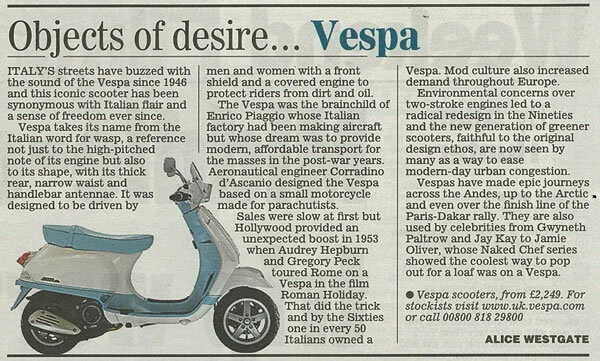 The Vespa PX retained its traditional solid steel body but had a new and improved Euro 3 engine. The steering cover had been enhanced and the saddle modified to provide more rider comfort. A 125cc or 150cc, single cylinder, two stroke engine with forced air cooling, CDI electronic ignition and both electric and kick starters. If you would like further information or wish to purchase a Vespa PX 200 simply call one of our sales team on 01226 203377. The launch of the most powerful Vespa ever built - the Vespa GTS 300cc Super proved to be such a success that Vespa decided to introduce the 125 version - the Vespa GTS Super 125c! Now they have improved it even further making extra room in the underseat storage compartment as well as ehnahancements to the appearance. The 125cc version is been fitted with an electronic fuel injection engine and offers incredibly high performance and practically, not to mention a stylish way of getting around town! 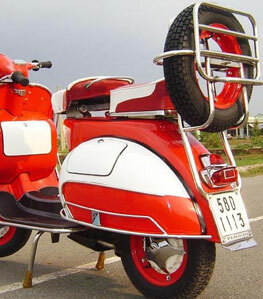 The racing soul of this superb scooter is obvious at first glance - the front suspension with the spring in bright red, the front shield with chrome trimmed grill, the round headlights with black trim, the sporty dashboard and the design of the black seat, clearly inspired by classic Vespa models. The Vespa GTS Super has a liquid cooled, four valve, four stroke engine which absorbs less energy and helps reduce fuel consumption, providing sufficiently lower running costs. Service intervals have also been extended by 65% from 6,000Km to 10,000Km. performance and reduced fuel consumption. The standard equipment is rounded out with ASR electronic traction control. The steel frame and metal panelling gives the Vespa superior rigidity and control that you would expect and the chassis features 12 inch wheels with classic link arm front suspension that reduces the lunge effect and provides neutral braking. The revised Vespa Super Sport model comes with ABS and ASR traction control. It also benefits from the new Multimedia Platform, an add-on option that allows you to connect a Smartphone and use it as a virtual dashboard, with everything from lean angle and acceleration to engine diagnostics, navigation system and even a scooter finding option to help direct you back to your GTS if youre parked somewhere obscure, or are very forgetful. The 300 version also has the new HPE engine. All Vespa scooters and bikes now come with 2 years manufacturers warranty as standard and all Vespa scooters over 50cc will come with 12 months roadside assistance and homestart. 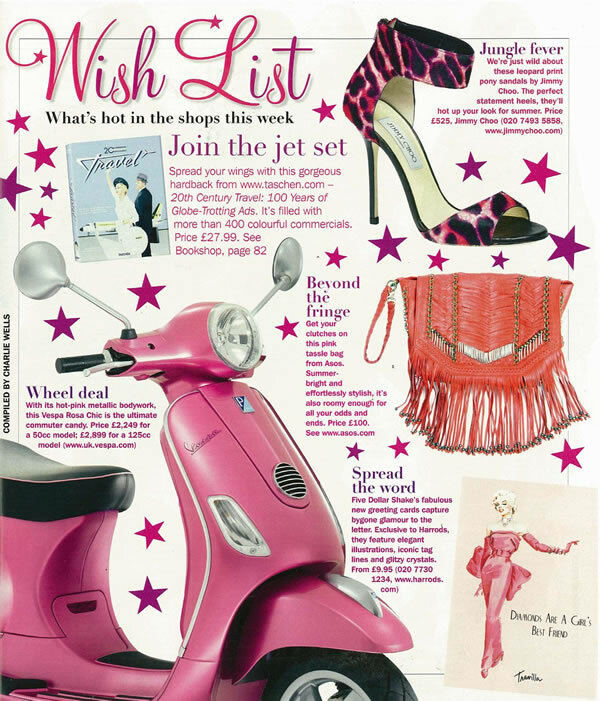 More great reasons to put Vespa on your shopping list! Got a Used Vespa for Sale? Scooter Crazy are always on the lookout for used scooters, in particular the PX model. If you have a used Vespa scooter you no longer want or would like to trade one in for a new model then call us now on 01226 203377 for an offer. 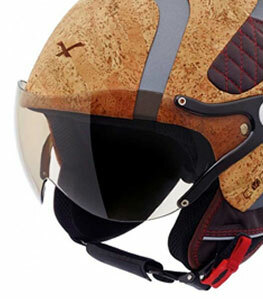 Want a Vespa Helmet to match your scooter? Not a problem. Scooter Crazy Ltd stock the full range of Vespa Helmets including the new GT and GT 300 helmets, the Vintage Vespa designs and the Vespa Soft Touch Helmets. 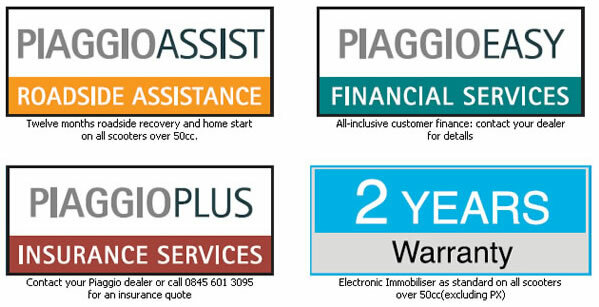 All these offers are available now at Scootercrazy, Barnsley, South Yorkshire. 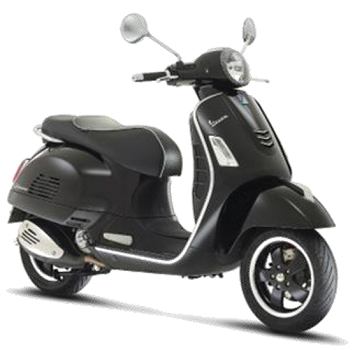 For the cheapest Vespa scooter and moped deals contact us now on 01226 203377. Remember, the best scooter deals in Bradford, Leeds, Wakefield, Halifax, Mirfield or Dewsbury are in Barnsley at Scootercrazy!